Blatter to resign. What now for the Nepali worker in Qatar and where does FIFA go from here? Sepp Blatter walks out of the press conference after he delivers his resignation speech. "I felt compelled to stand for re-election, as I believed that this was the best thing for the organisation. 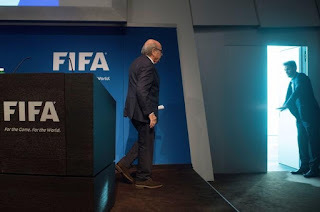 That election is over but FIFA’s challenges are not." "While I have a mandate from the membership of FIFA, I do not feel that I have a mandate from the entire world of football – the fans, the players, the clubs, the people who live, breathe and love football as much as we all do at FIFA. Therefore, I have decided to lay down my mandate at an extraordinary elective Congress. I will continue to exercise my functions as FIFA President until that election. " This might explain why he chose to stand in the election in the first place but still cast some doubts among others why the resignation right after the elections. Hopefully the change in regime might help salvage something for the Nepalese workers who already have suffered so much. With the corruption scandal in FIFA being taken seriously, the attention could then be diverted to the thousands of workers in Qatar working under harsh conditions and being treated unfairly. Ultimately, justice might be served. Click Here to view Sepp Blatter's resignation speech in text form.